Loribela was my first Judgement model and really my first taste of the 54 mm scale for anything other than Warjacks and Warbeasts. I had already wanted to do a green overcoat for her, so when I saw the studio scheme had one I essentially copied it verbatim to both ensure I was painting to a reasonably high standard, and to make sure I had the focus of the model on the face where it is supposed to go. 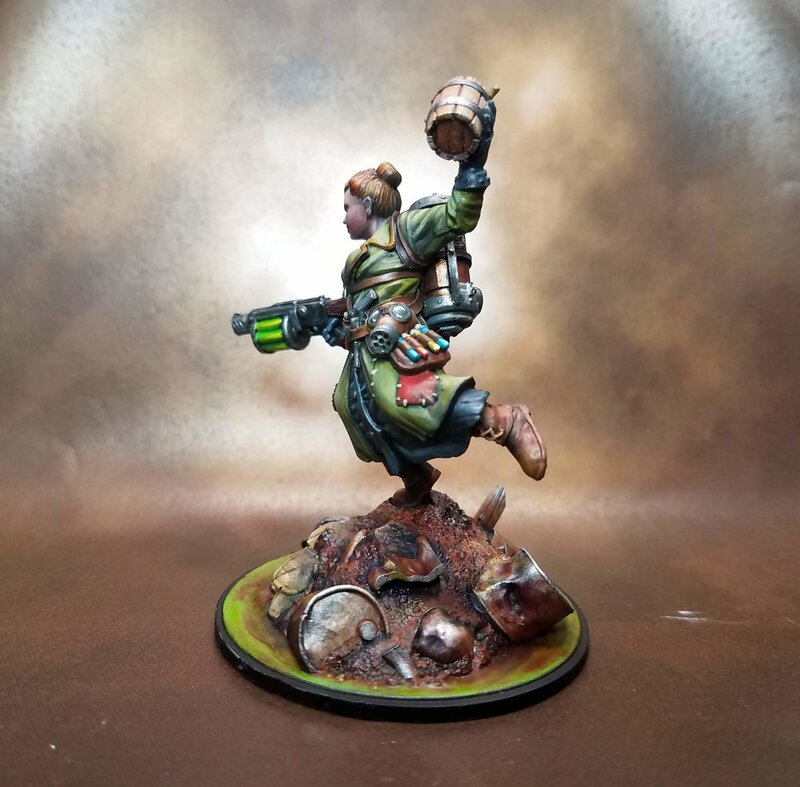 She was the first Dwarf Model I had ever painted that I liked, and I was extremely excited for more. Thrommel was the second model I finished up, being too intimidated to paint Istariel next. I started to make minor changes from the studio scheme here with a black beard and dark trim. As usual, I had a challenging time with the metallics. I find that the true metallic metals are incredibly difficult for me to paint well, and this was no exception. The metal plates took more time than the entire rest of the model. Once more, heavily influenced by the studio scheme, I took my best shot at this extremely challenging model. There is absolutely nothing wrong with looking at the work of better painters and trying to get the same results. The blue stripe in Istariel’s hair was inspired by my wife, who was fond of doing that with her hair when we met. 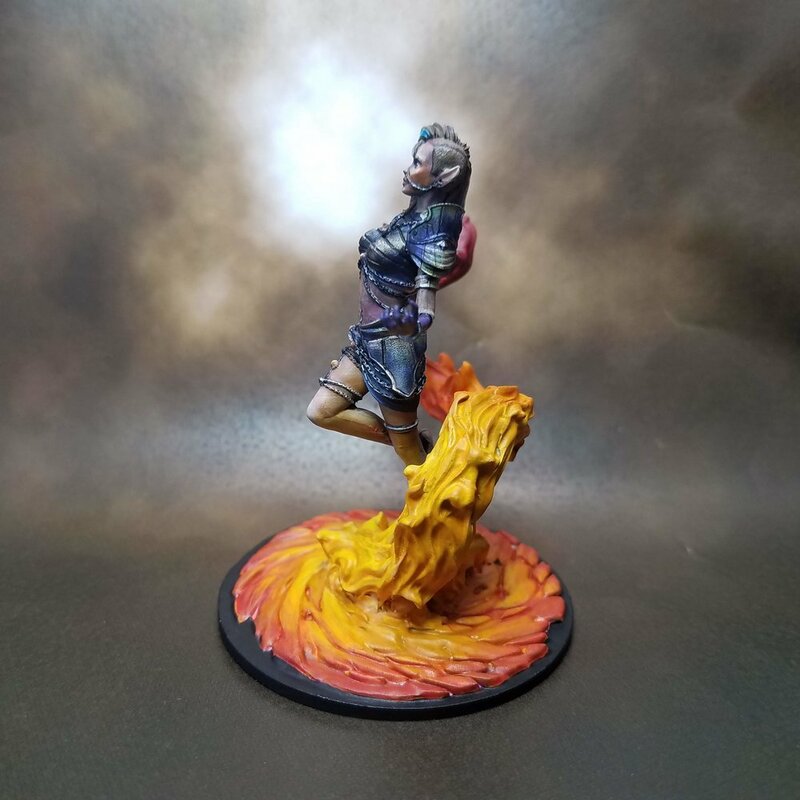 This is her favorite sculpt out of the first wave of models, and I thought it would be a nice little tribute. 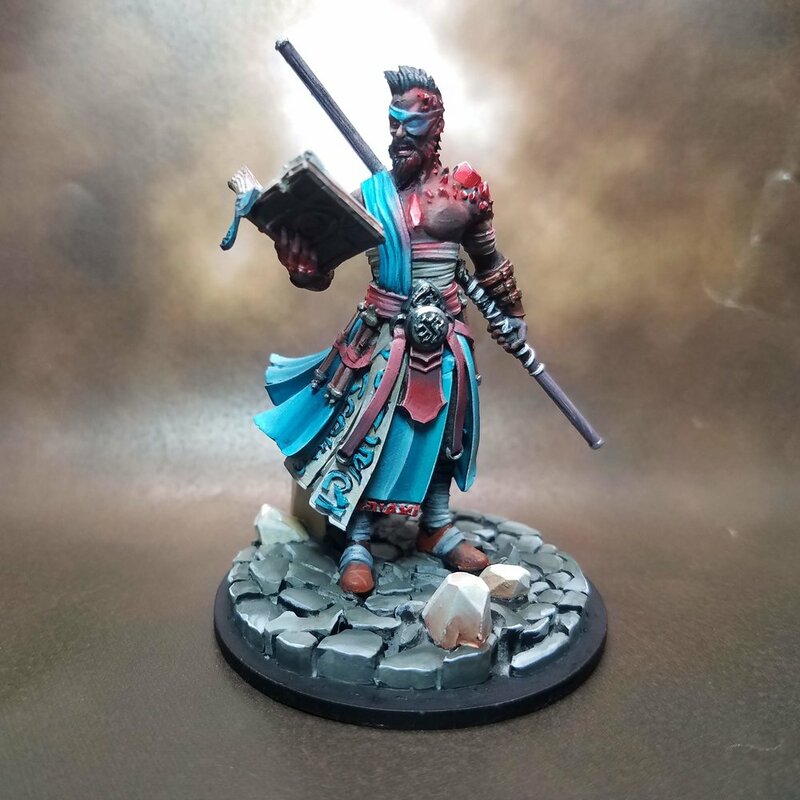 I was finally starting to get comfortable at the 54 mm scale by the time I got to Rakkir, and I started to experiment quite a bit with his scheme and pushing the boundaries of what I can do with a brush. 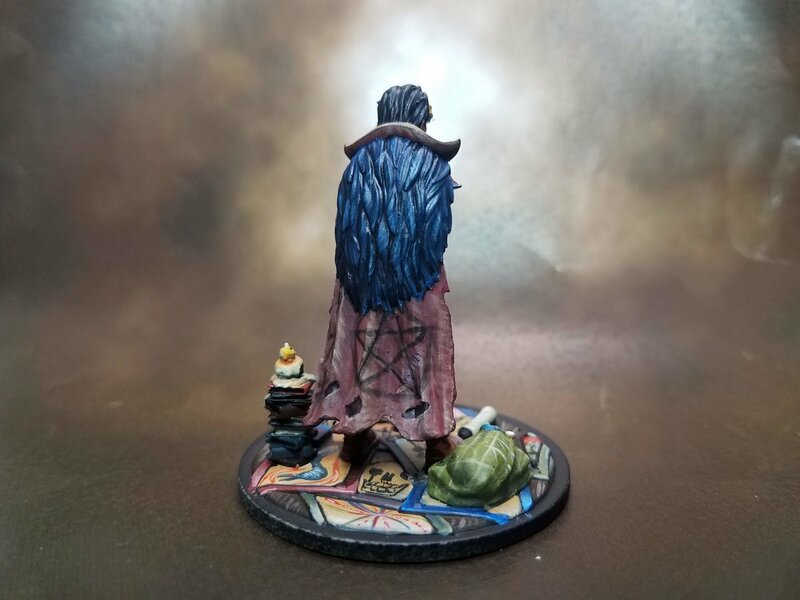 The two tone cloak was almost scrapped after the basecoat, but friends told me to highlight and shade and see how I felt, and as a result he was saved. The base was another self-inflicted challenge, as I tried to simulate marble in the stone with varying success. 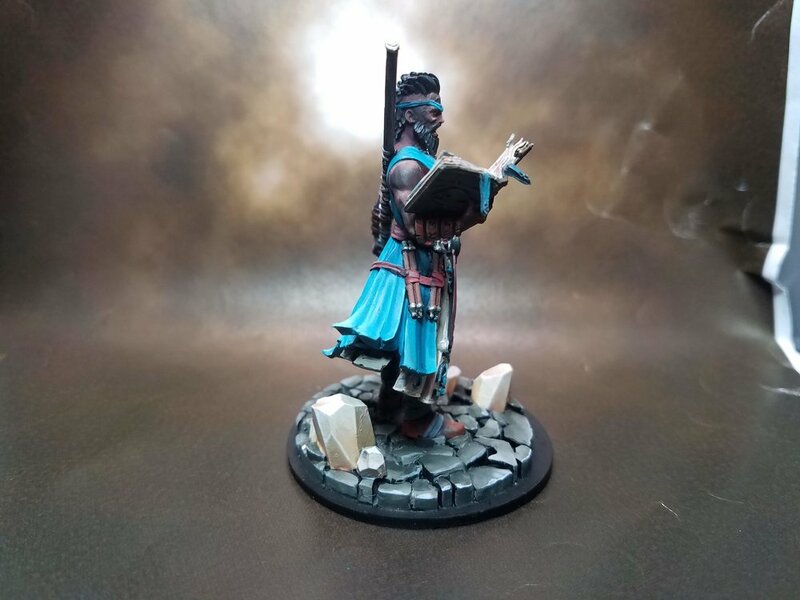 I am most proud of the painted cast shadow on this model - it is difficult to see unless you look for it, but the stone underneath him is painted darker than the stone that is out from under him, which lends the model a more realistic air. 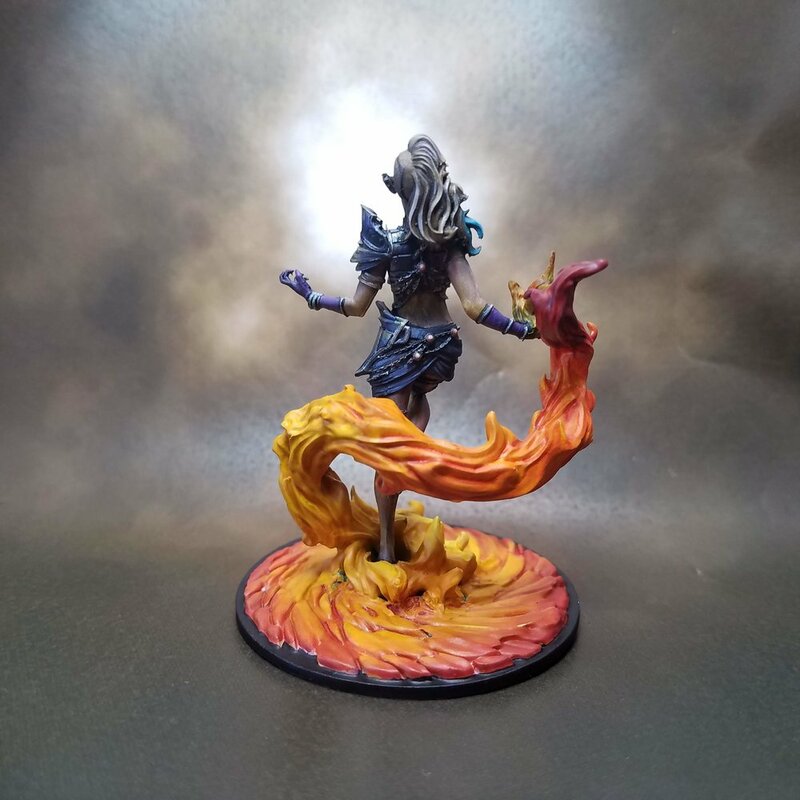 I spent two or three days working just on the Soul on this base. Originally it was bright red at the bottom and faded up to bright blue. 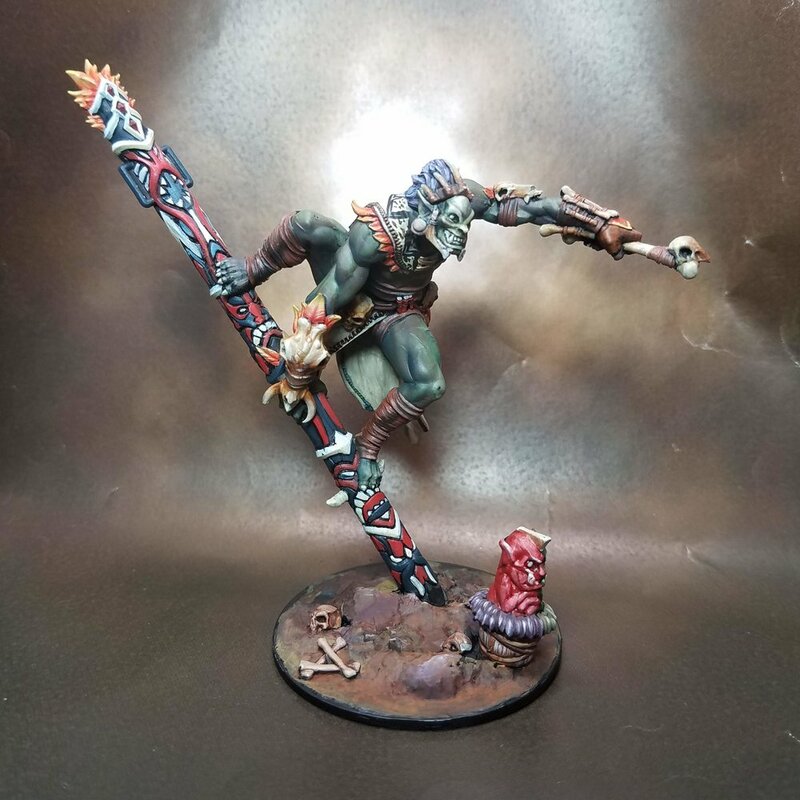 But after much deliberation and discussion with people who are much better at this than I am, we concluded that the bright red on the base would draw the eye away from the main focus of the model (the orc himself). So, a little sadly, I re-did the soul to make it less visually grabbing and finished up the dynamic pose. I had some intricate freehand blocked out for his cloak, but I was having problems with my brushes and did not want to risk it, so he remains unadorned. If you had to ask me which model in the Judgement line caught my eye first, it would absolutely be this guy. Out of all of the wave one heroes (and probably wave 2 as well! 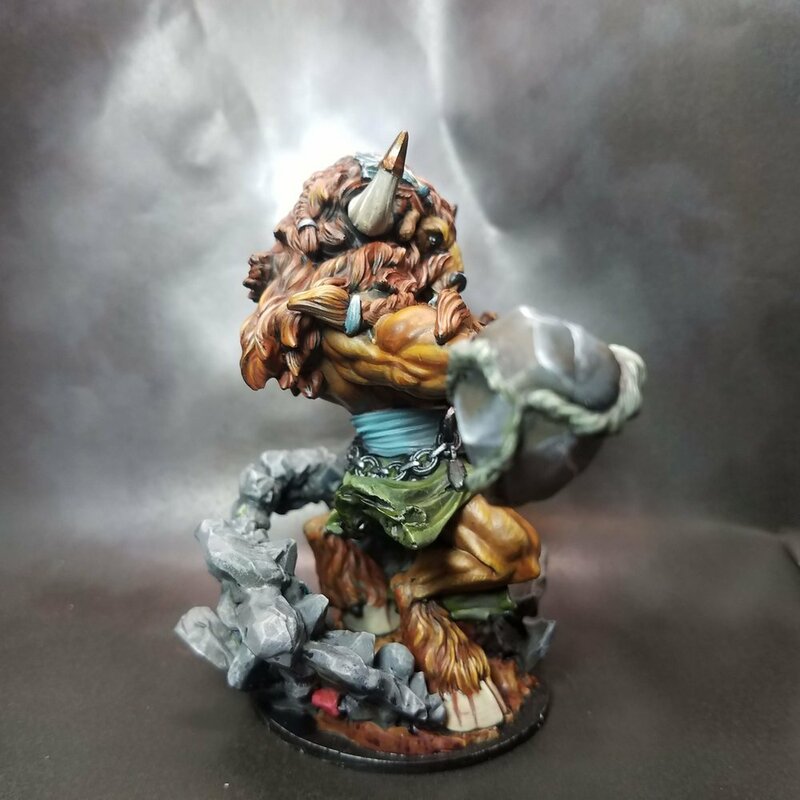 ), Doenrakker is my absolute favorite sculpt. 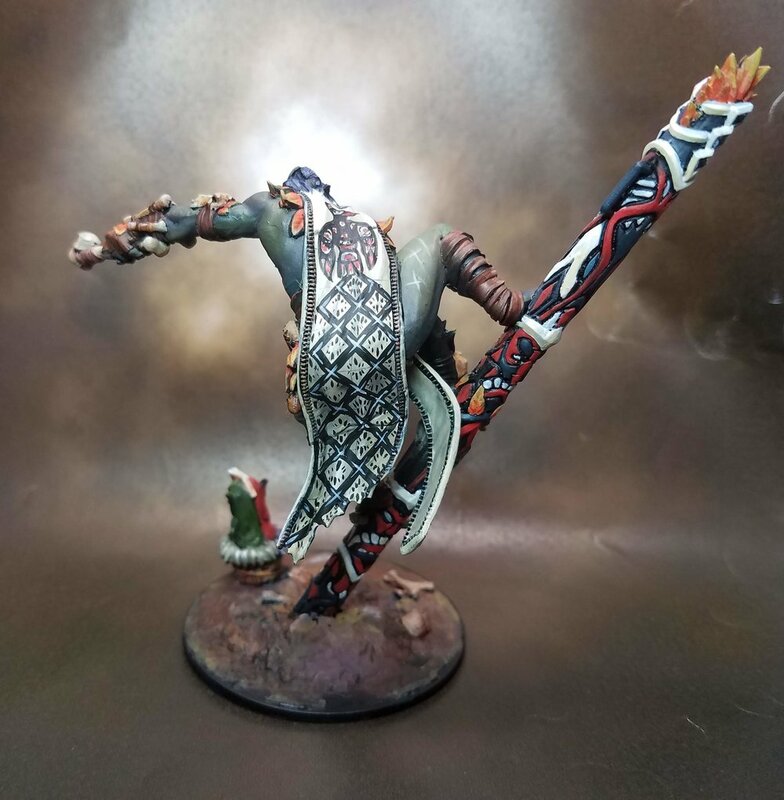 He is also so intimidating that I held off on painting him until I was extremely comfortable with the scale and style that I would be painting the miniatures for this game in. One of the things that I really wanted to do differently from the studio scheme with him was making the difference between his body and the base very apparent. 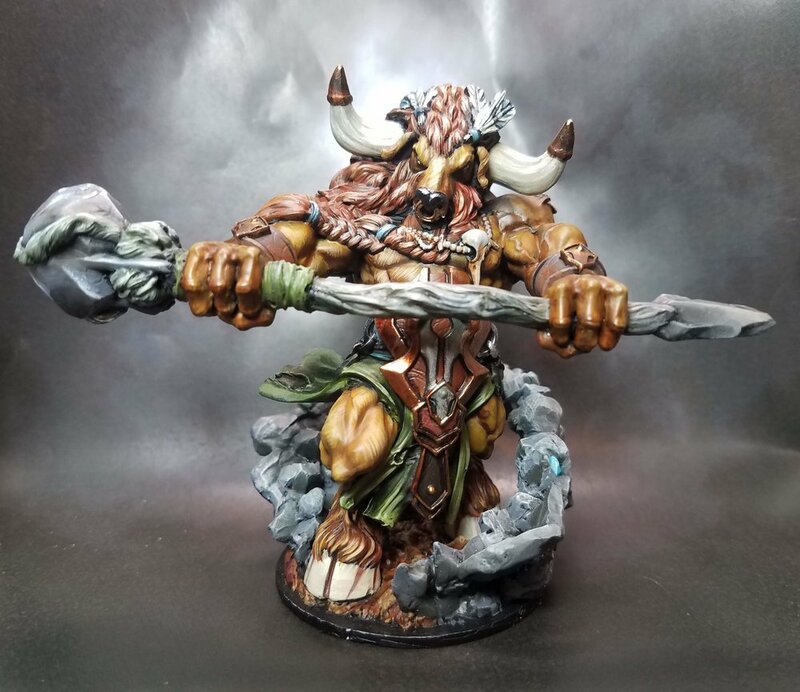 I rushed a bit in my excitement to get to the minotaur himself, and used quite a bit of dry brushing on the stones in the base, and then went back in and added some gem stones for visual interest. I struggled for a long time with the body, as the bronze armor faded into the flesh tone pretty extremely. Eventually I was able to place enough contrasting colors in enough places to make it, I think, visually distinct. While I am very happy with where he ended up, this is definitely a sculpt I could see buying again in two or three years and spending a considerable amount of time making him as pretty as I can. This is another model that went through numerous revisions. The original phantasm illusion was white and faded from red to blue (sound familiar?). Once I had painted the “real” Piper though, it became obvious that the phantasm was both drawing the eye to it and also not looking as good as the flesh and blood Elf behind him. With that, I tried to do a combination of phantasm/real and failed epically before giving up and just painting both elves fleshlike (although I did put a little homage to my red/blue scheme with the daggers). 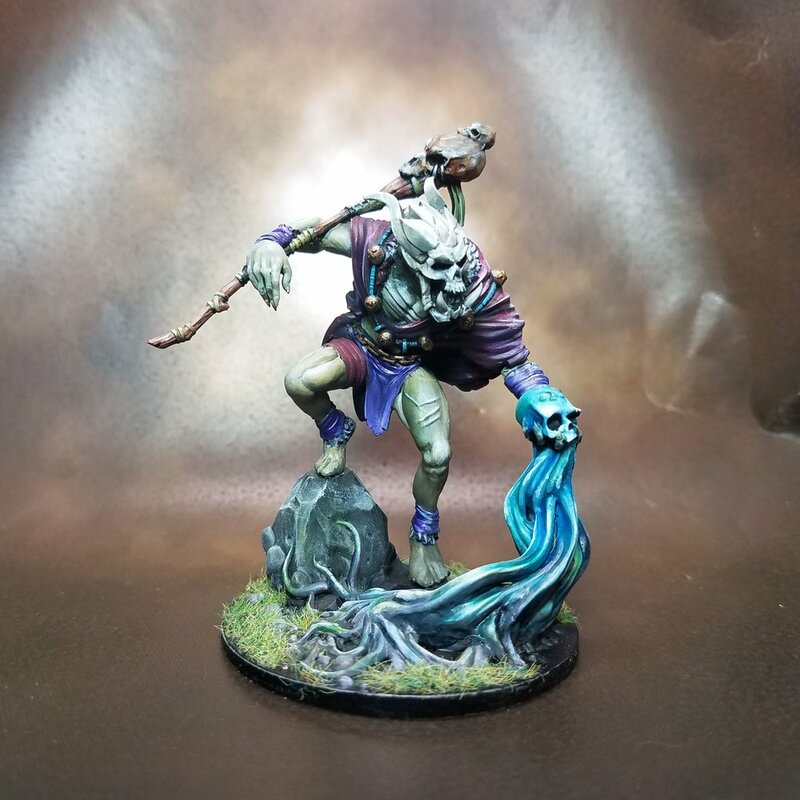 This is one of the most eyecatching sculpts of the entire line, and is another that I could see myself picking up again in a few years and lavishing attention and work on. 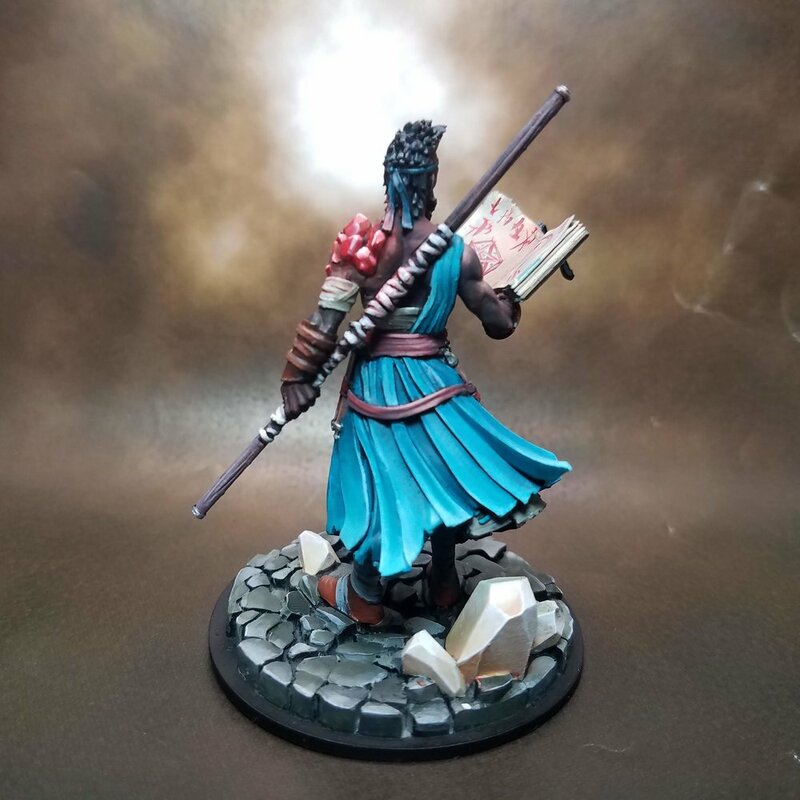 Saiyin is the last member of my two demo Warbands, and she was extremely challenging to paint. Her model is extremely delicate, and painting faces is another one of the things I have a problem doing well consistently. I watched quite a few tutorials on Youtube (thank you Painting Buddha, we miss you!) 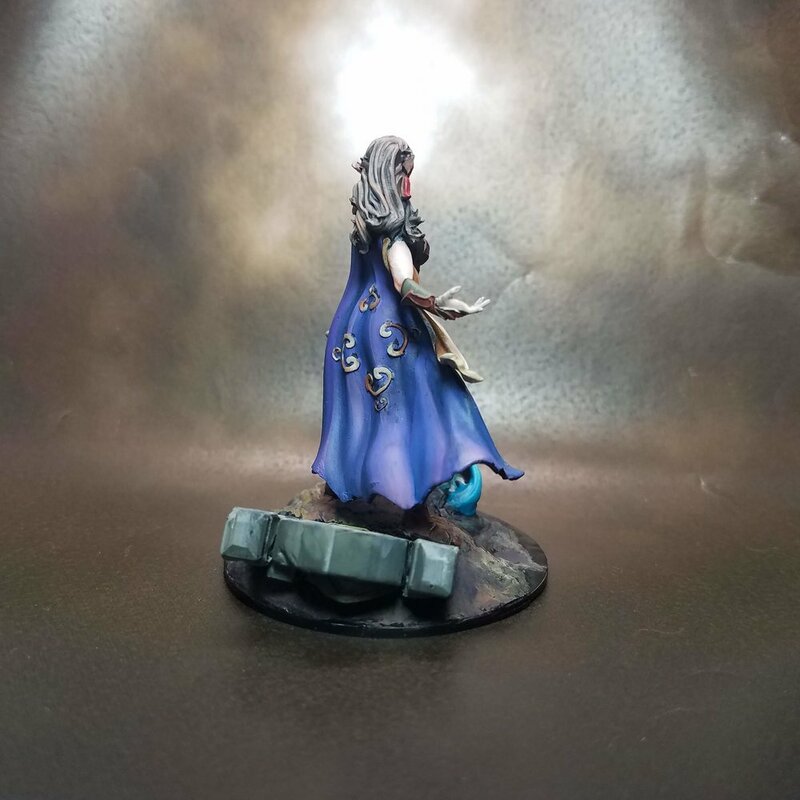 and in the end was fairly happy with how she turned out, particularly the highlighting on her cloak. 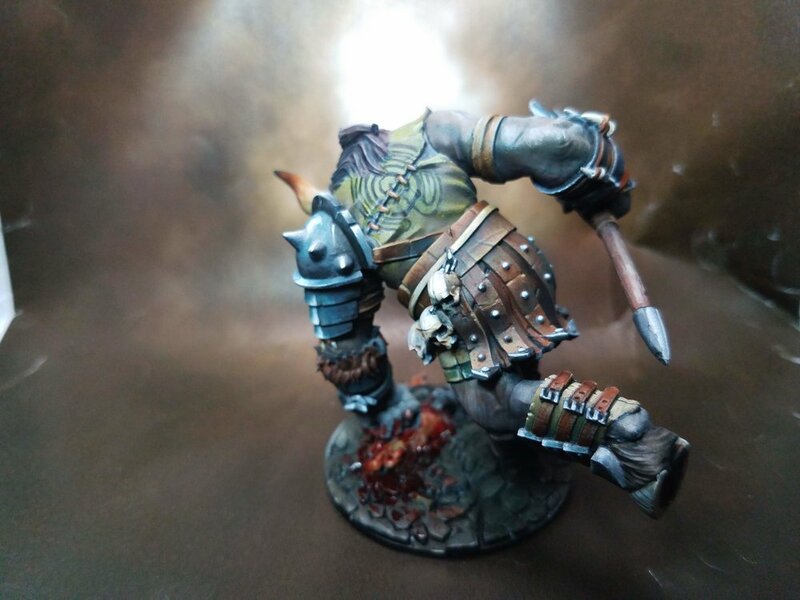 I was saving Bastian for when my Scale 75 flesh tone paints showed up, and once they did I had a pretty crazy set of things I wanted to try. First of all, painting African esque skin is something I have struggled with throughout my painting career and I really wanted to try it at this bigger scale. Secondly, that blue to red in the same piece was just begging me to make it work somewhere, and I felt like the gems all over his body was one of the ways to make that happen. 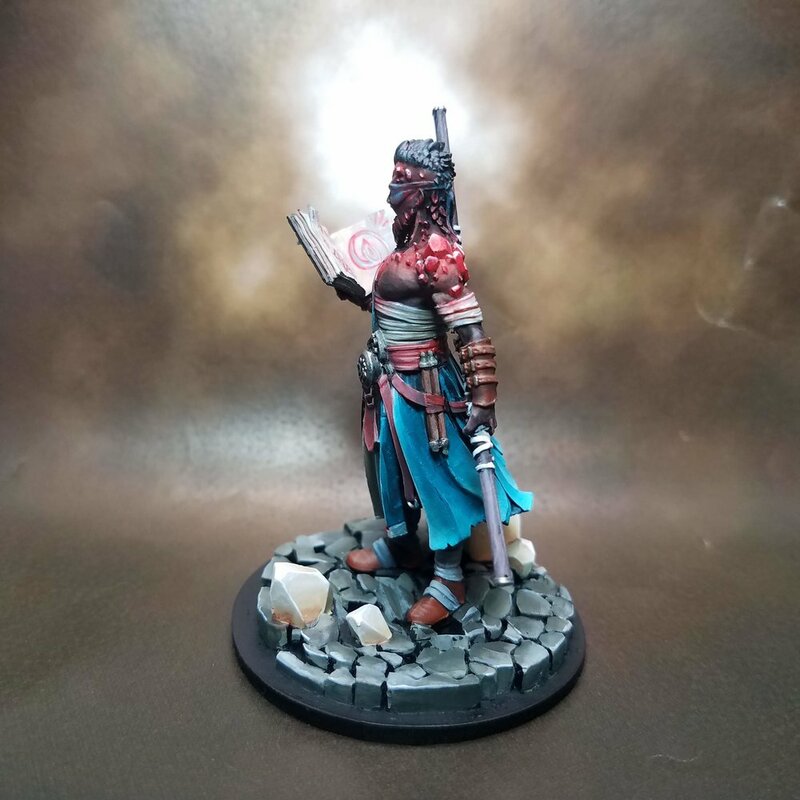 In the end, I almost ruined the balance by putting giant red rubies on the base, and had to backpedal pretty rapidly in order to keep the focus on his face. 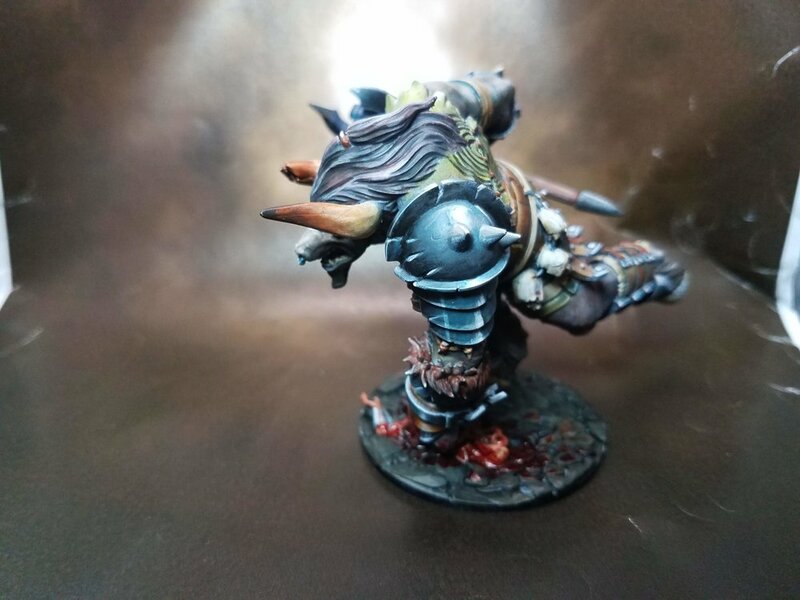 These models are a fantastic canvas upon which to push yourself painting wise. The big swathes of cloth, the larger faces with fully expressive lips and eyebrows, these are all things which are a challenge to undertake but incredibly rewarding when embraced. I mentioned that I wanted to do some ambitious freehand on Kruul, but that I had wussied out. I knew that Haksa would be a perfect place for a true attempt and after several incredibly nerve wracking hours, I emerged from the other side. This is my brother’s favorite model in the entire range, and I really hope I did it justice. 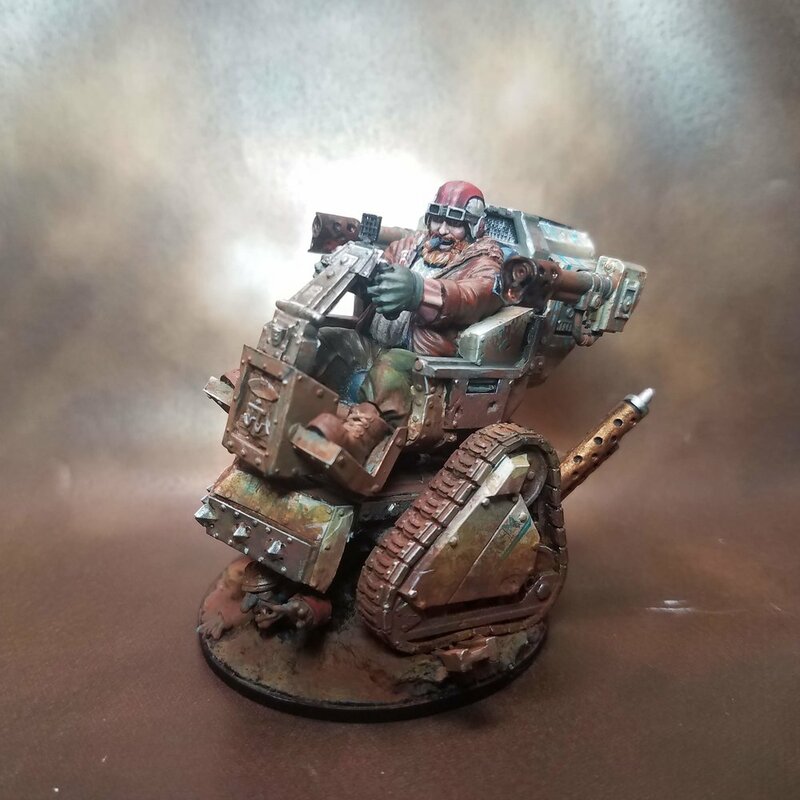 I have to admit, my first impression of this model was “this is kind of strange looking, why is his tank a wheelchair?” I then read a little more about Barnascus and discovered that in the fluff, he’s a paraplegic and his legs do not work on the material plane at all. 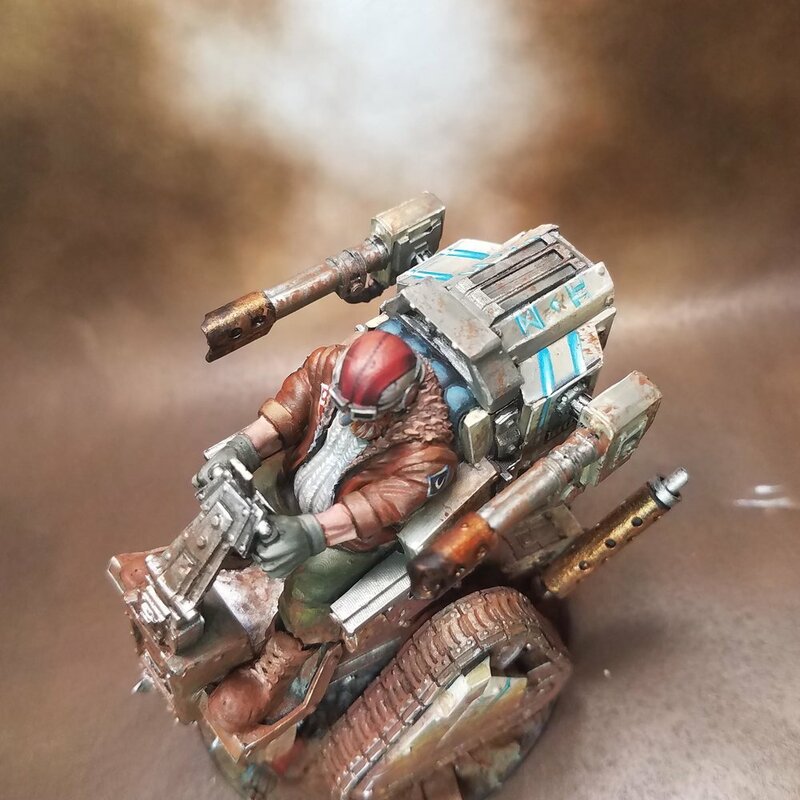 Being summoned to Between to fight in the soul skirmishes lets him technologically overcome this barrier with an armored wheelchair/tank that also happens to have two large flamethrowers attached. 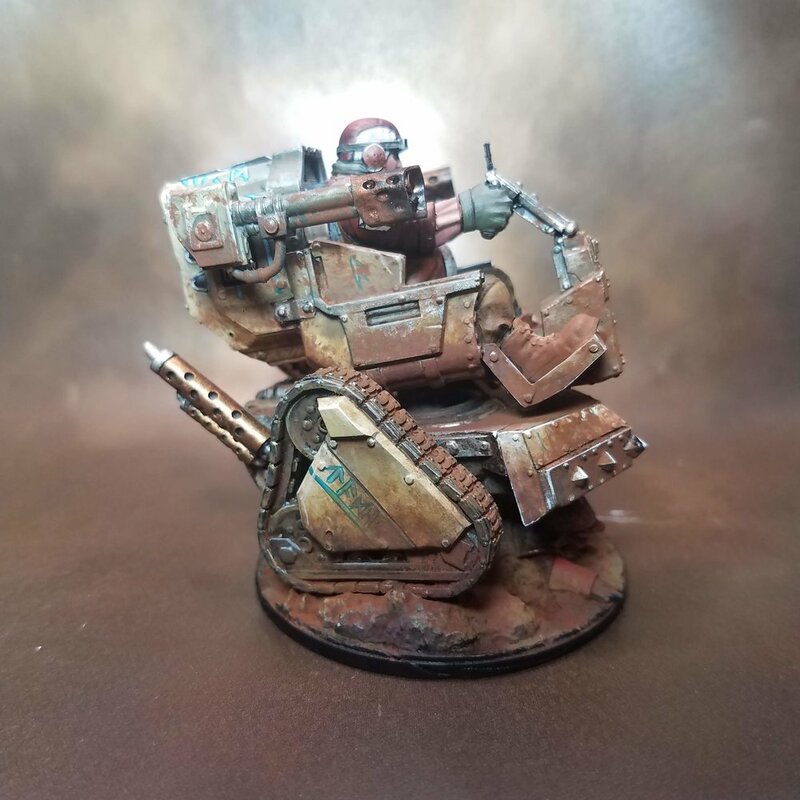 When I started to paint him, I had this image in my head of a pristine sleek little machine with lots of aggressive edge lighting and blue dwarven runes all over it. 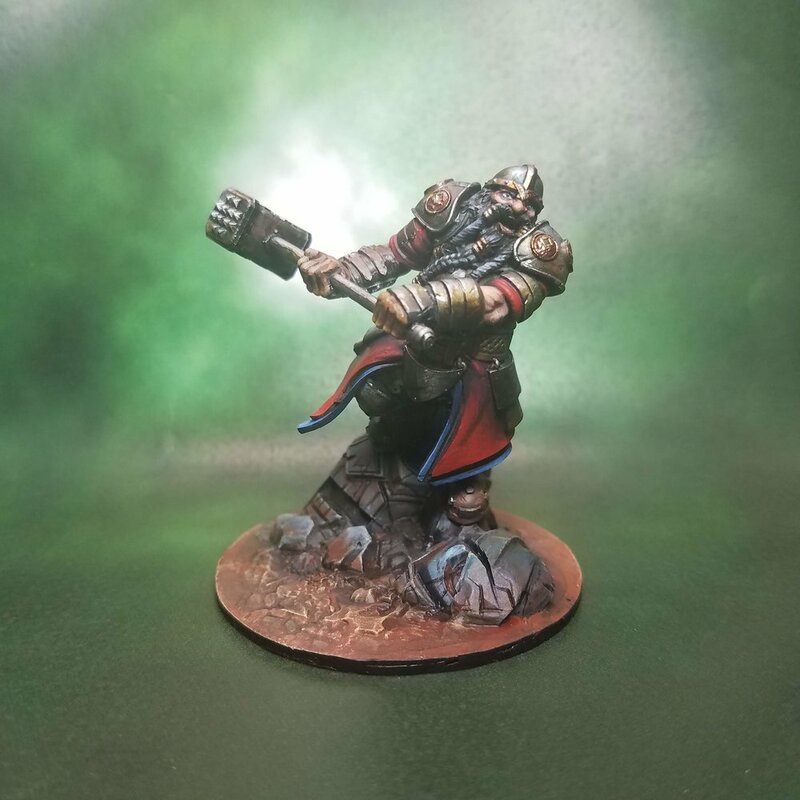 Viktor is the only non 50 mm model in the entire Judgement range to date, and he has one of the coolest looking models to accompany him as he casually hex bolts people and manipulates souls. 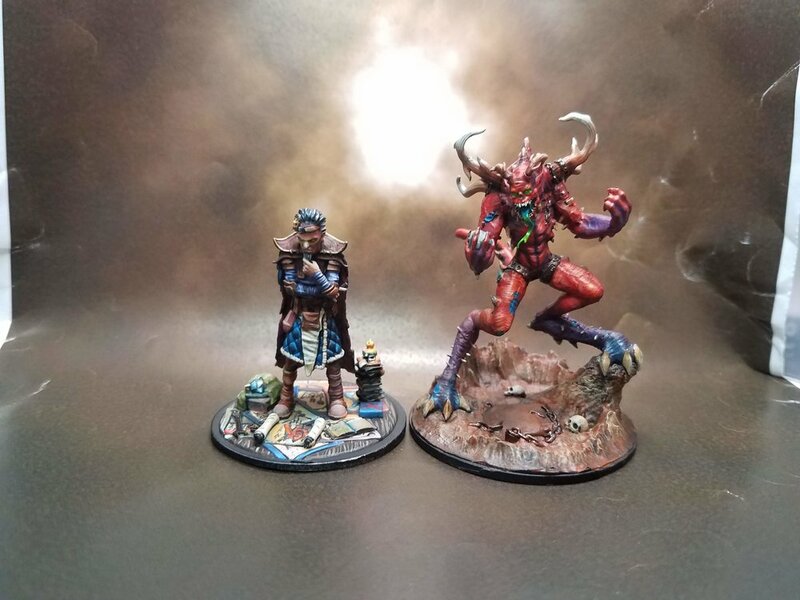 This pair of models took a long time to finish from a chronological perspective. 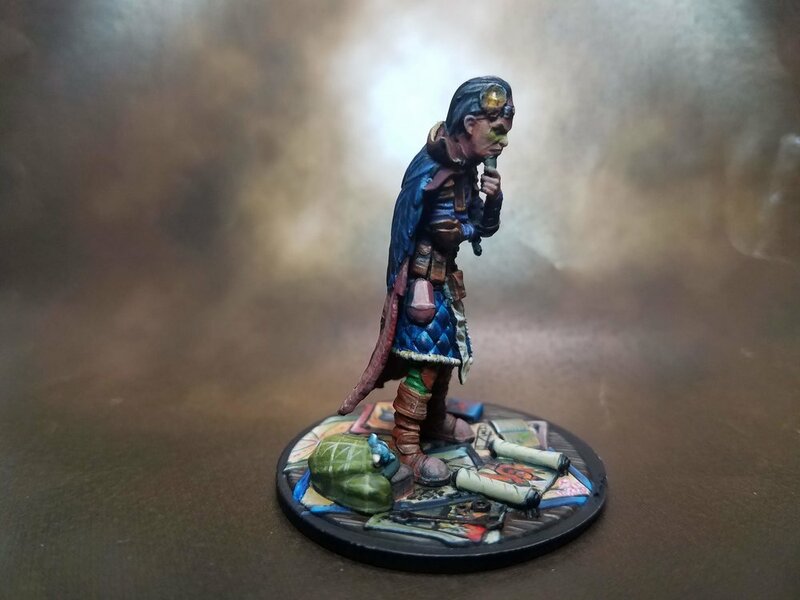 I started painting them, stopped, picked them up, stopped again, and it took nearly a month of start and stop to get Viktor himself done. A lot of the issue came from his cloak and hair. I originally really wanted to do them very pale but I could not make that look even remotely okay no matter how hard I tried. Eventually, a friend suggested going dark instead and it started to click right away. I kind of went insane on the freehanding on the scrolls, but….hey, I only have to paint this guy once, might as well go all out right? His demonic friend Al’Garath was a challenge for another reason entirely. 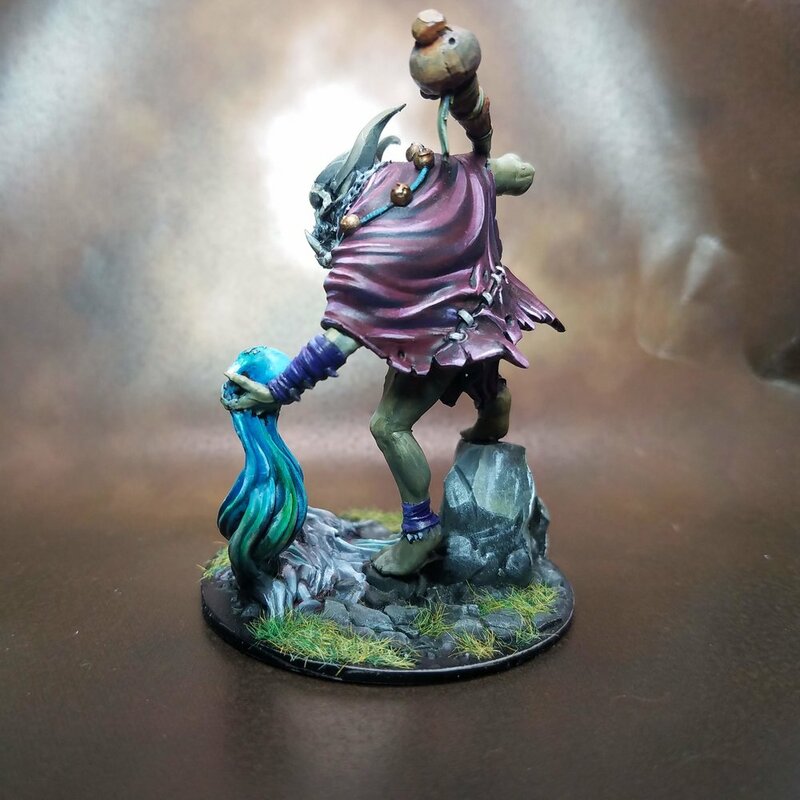 Initially I wanted to do him very cracked and dry and dusty and sandy, but I quickly found that the brush I had was too worn for the intricate detail work I wanted to do in that style. While waiting for a new one to appear, I grew bored and just changed the scheme entirely and made him into a more traditional demon. And here the pair are together. These two are very fun to play together, and really change the game when they’re on the table. I was able to play a non-demo game for the first time in Portland, and after that experience I found myself in love with a Haksa, Doenrakker, Rakkir, Bastian and something Warband for 3v3 pick and ban. 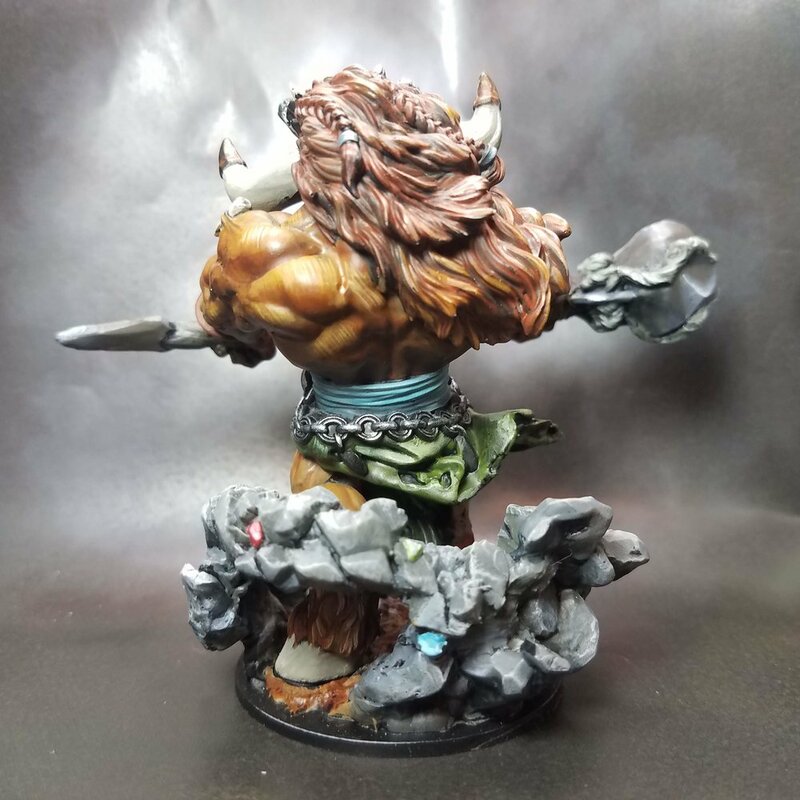 I could not, for the life of me, decide what that something was for several days afterwards, thinking seriously about Brok, then Kogan and eventually settling on Thorgar. This was interesting to me since Thorgar is, in many ways, my least favorite melee aggressor, but he really fits the bill of a tankier Aggressor that can dish out some damage and take a hit back. This was a difficult project that took somewhere between 25 and 35 hours of work. I don’t often work with Non Metallic Metals, and I wasn’t sure if this was the correct place for them. I’m glad I tried it again though, since they turned out better than the last time I tried it and really pushed me to get better at blending and placing highlights. Even now though, I’m not totally satisfied with it but it is time to move on to something new.